Are you ready to move into wellness? Whether you have aches and pains or have always wanted to feel stronger and more flexible, I have the solution. I myself have been to chiropractors, massage therapists, physical therapists and acupuncturists who have helped me feel better — but the changes have only been temporary. When practitioners focus on one area of the body, they can often miss seeing the bigger picture. As a doctor and movement therapist, I look at your body as a whole and I get to the root of what is causing you pain or discomfort. My Move Into Wellness approach incorporates a combination of bodywork techniques as well as the retraining of muscles in order to correct your musculoskeletal imbalances. The result is lasting relief from chronic pain and an improved sense of well-being. Together, we break down restrictions in your muscles that have been limiting your body’s ability to move efficiently. Once those patterns are released, I then help you become aware of the habitual movement patterns that have created your musculoskeletal imbalances. This is when you start to feel the real difference in your body. You reclaim parts of yourself that have been ignored for years. These changes in awareness lead to a new perspective on how you meet the world. And the world will notice the difference! Your visits will include an individualized combination of Structural Integration, Spacial Dyamics, Acupuncture, Cranial Sacral Therapy, Pilates, and Holistic Pelvic Care TM. You will receive bodywork as well as learn exercises that will change your movement patterns and tone your muscles. Your body will feel the difference. My sciatica improved after my first visit. After just three very relaxing visits, I had no sciatic pain. Now whenever I get any aches or injuries, I make an appointment right away. I highly recommend Liz if you are struggling with pain anywhere in your body. 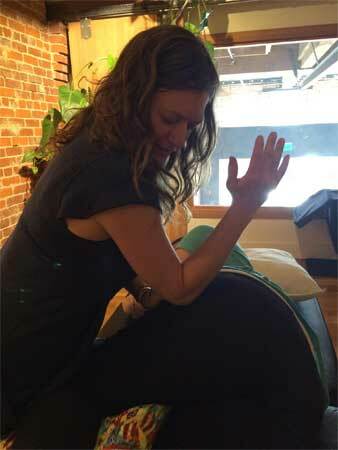 If you are ready to create a new relationship with your body while alleviating your daily aches and pains, I invite you to schedule your first visit and begin moving into your full potential. Whether you walk, run, climb, dance, swim, bike, ski or sit at a computer, it is time to Move Into Wellness! Ready to Move Into Wellness?